So another alcoholic beverage session coming up. This time we will be brewing mead. Bucket (or fermenter), 1 is enough 2 could be good if you want to move it to the other vessel after the first fast fermentation is over. I get my honey from my wife's coworker who owns a bee-farm. Mostly honey that is too old to be sold but good enough to brew on. So locally made and free, can't get much better. Start with boiling some water. Just a little so that you can disinfect the bucket and ladles that you are going to use, don't forget the lid, thermometer and water lock. Put water on boil. The formula that I've used before is 10 liters of water for 3 kg of honey. This time I think that I will try with a little less water but its still a lot of water. So start boiling. Weigh and put all the honey in the fermentation bucket. 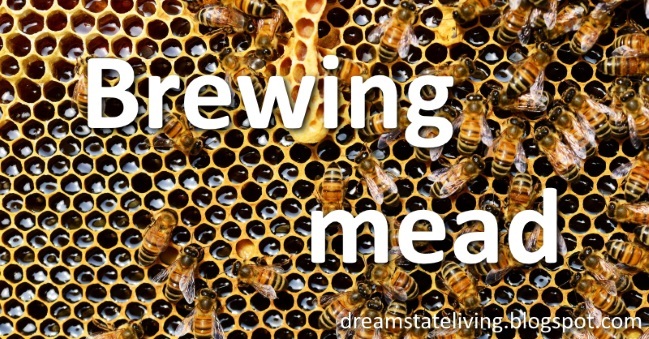 Fill up with boiling water, this will kill any wild yeast and bacteria that is in the honey that can destroy your batch. Stir around to help it dissolve. After it is dissolved, fill up the hydrometer and check the temperature. Let the test glass cool to 20 Celsius to make a correct reading. When you have the correct temperature, use the hydrometer to do a reading and write down the number as you will need that number when you bottle to calculate the alcohol percentage of the liquid. My reading was 1.100 Specific Gravity at 23 Celsius. i.e. 1.101 SG after compensating for temperature. At this point you will need to cool the bucket, I usually put on the lid with a water lock and place it outside for a couple of hours. You could I guess use a cooler from beer brewing but I think that is a little overkill for this. Usually it has cooled over night and I can set the yeast. This time I will use wine yeast that needs to be pre-hydrated 15 minutes before usage. Just warm some water to 40 Celsius and stir in a glass. After 15 minutes, put the mix in the fermentation bucket and close the lid. Check that the water lock is sealed and put it somewhere where it can stay for a week or two. Turns out it didn't start fermenting that fast, I probably kept it too cool the first 2 days. Moved the bucket to the living room instead and now it is bubbling. Will probably let it be for some while before testing it the first time. I kind of forgot about that mead keg in the cellar. Some other things on my mind this year. Turns out that it actually tastes quite nice after 12 months in the fermentation keg. Will keep it for a while more as I do not have anything to tap it to. Until next time: Planning an epic bike ride with Strava and Google Earth! Only eight weeks to go on my chemotherapy! Last week I had a chat with my doctor regarding the risk of cancer popping up again after the treatment is completed. The doctor told us that he did not have the numbers readily available but would look into scientific articles and talk with colleagues and would come back. No exact numbers, evidently not a question asked when it comes to bile duct cancer..
What he was able to find was that the chances for this being a one time thing outweighs the risk of it returning. So that's positive, right? Better then 50-50 at least. The fact that the tumor was found early and that it hadn't spread to any lymph nodes speak in my favor. Had it spread to the lymph nodes, the numbers would have been a lot darker. I actually don't know what to do with this information. I guess it is human to want to know, but then being unable to do anything with the piece of knowledge. But I guess this is as good as a prognosis can get... And there is always a risk of backfire, should keep that in mind as well.. Not worry about it but know that it is a possibility. So I'll be focusing on one day at a time and do the things I want. Life is short and you never know what will happen. Why I am writing this? Not to feel sorry for myself, but as a way to handle the situation and hopefully someone else out there in a similar situation can find this helpful as well. The human body is strong and hopefully I'll come out of this stronger as well. Plan for the worst and hope for the best! If you find this post interesting, please leave a comment or share on social media, not required but appreciated! Another cycle nears its end and when this one is done I will be halfway through my chemotherapy. This cycle has had its ups and downs just like the ones before just in its own way this time. Started out with getting really tired the first 4 days, couldn't go to work on Monday and Tuesday, but after that the it got a little better and I was able to do my 50% the rest of that week. One thing that I've noticed is that if I push myself to train, even for 10 minutes with slow tempo, I don't have to go to bed in the afternoons. It just feels counter productive to put on the running shoes or change into cycling gear when my body screams for the bed. But it has been worth it each time, tired in another way afterwards and more awake. Tired in body, awake in head instead of just tired. So, no big training sessions while in a chemo-cycle but at least I do something. Other than the training and the positive effects from that I haven't had as many anxiety attacks this cycle. Had a big one though and actually ended up crying for twenty minutes with no control of it. The 'normal' anxiety attacks I usually get just pass by and brings up tears but seldom last for more then a minute or two. This one made me cry for real, for the first time since I got the cancer news in January. I guess its part of the process, things starting to hit home. Not trying to focus on these things, just note down in my treatment diary that I had an anxiety attack and move on to other things like coding, training or just read a book. Another big thing I guess is that I've started reading other peoples stories on twitter. I don't think that I can cope reading a longer post at the moment, but scrolling down twitter tags has made me able to process things in a different light. From when I got the news in January I've said that I don't want to know more then what the doctors tell me, I haven't googled my disease and I've kind of blocked out most of the outside world on this subject and just focused on getting better. But now, 10 months later, I think that I'm ready to read up a little more. Not going to google my cancer form, but read up on how other people are coping with their journey. I don't know how it is in the rest of the world, but here in Sweden, October has become the pink month. This means that the Swedish Cancer Society runs its breast cancer campaign and this includes a lot of companies doing cancer related advertisements. Hard to miss, and this year the campaign has really hit home and made me really emotional. Haven't really care during previous years but now, having a lot to thank cancer research for, I really wish everyone could donate money to cancer research instead of buying a cup of coffee. Or if you live in Sweden, just buy the ribbon! So, almost halfway through the treatment.